What’s being done in Washington? It’s hard to imagine: In 2018 more American moms are dying after childbirth than ever before. Each day approximately 137 women suffer life-threatening complications from childbirth according to the Center for Disease Control and Prevention. That's one mother every 10 minutes. The most tragic part? The vast majority of these deaths are preventable. Amy and Peter Cangany found out they were expecting their first child in January, a baby girl they planned to name Noelle. Amy and the baby’s health were their top priority during the pregnancy. The Bothell couple followed their doctor’s recommendations and did their prenatal checkups. All their ultrasounds came back normal. "We thought we were doing great,” Amy said. But when Amy was 34 weeks pregnant, something went wrong. "I went in for my week 34 check-in with my OBGYN, and they had noticed that my platelet levels were extremely low," Amy said. Doctors told Amy they didn’t want her platelets under 150. She was down to 27. Her liver had stopped working, and her red blood cells were bursting. 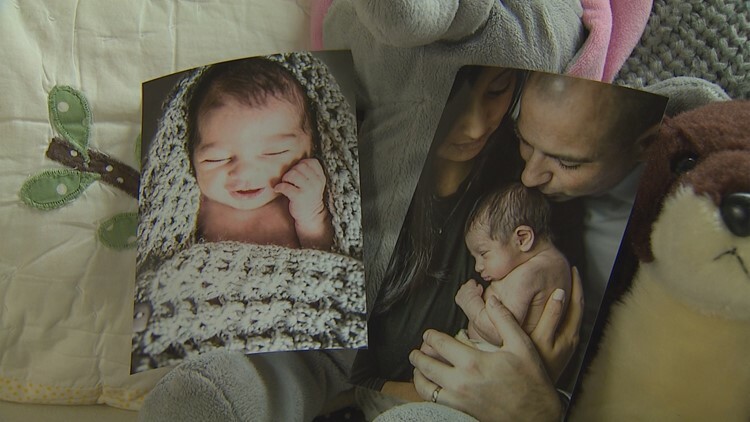 Amy was rushed to Overlake Medical Center in Bellevue for an emergency Caesarean section. "Everybody was moving so quickly. I guess that was the first time that it really registered …. There was something really wrong going on here." That’s when Amy realized she was in her own worst-case scenario. "I remember just praying and saying -- just hoping that the doctors would have the guidance to be able to deliver Noelle safely, and of course for the health of myself,” she said. Peter couldn’t join his wife in surgery. He had to be in the waiting room, not knowing what was happening with Amy or their unborn child. "I just wanted them both to be alive,” Peter said. Doctors successfully delivered a healthy baby Noelle at 12:49 p.m. on Friday, August 10, 2018. She weighed 4 pounds, 9 ounces. Amy would recover in the intensive care unit and would have to wait for hours before she could hold her baby girl. "I'm not going to forget. It was 11:51 p.m. because I remember being so sad that I wasn't going to meet her on her birthday, but they brought her over for me. And that was the first time I met her and the only time I got to see her for the next two days," Amy remembered. Amy still has questions about her complications. She’s still working with her doctors to figure out what went wrong. Initially, she had to take four different blood pressure medications six times a day. Now she is down to one medication. Amy is among the 50,000 women who almost die every year from pregnancy-related causes in the U.S. Seven-hundred mothers don't survive each year. More than half of those deaths have been deemed preventable by the CDC. African American women are three to four times more likely to die from pregnancy-related complications in this country. They are more at risk than any other race according to the CDC. 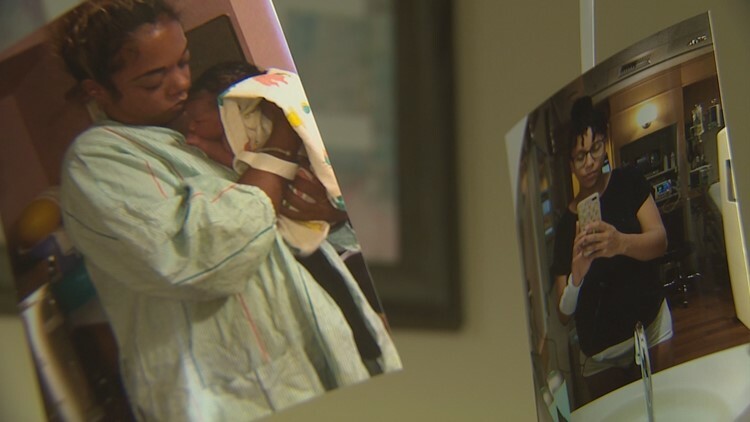 When it came time for Kristina Clark, a black mother in Seattle, to give birth, she understood the risks. Clark’s daughter Sahabiyat was born at 4 a.m. on June 21, 2018. “She was about a week and a half early, so she came right in her own time,” Clark said. Doula Rokea Jones with Open Arms Perinatal Services helped Clark through her pregnancy. Jones wants women in her community to feel supported, heard and safe so they can become successful moms. She says the disturbing trend isn’t new to her. "Communities -- low income, families of color -- these communities have been talking about, we've been looking at those numbers for a long time." She continued, "How could we be losing mothers, in the hospital no less, where we are told we are supposed to be safe?" Jones believes racism is built into the system. "What people fail to realize is that when someone, particularly a person of color, walks into a hospital room, there is a power dynamic established off the bat." Clark said that during both of her pregnancies she felt like doctors didn’t always listen to her. “I did not want to have another C-section. And not only did I not want to have one, there was no way I could care for my kids and care for myself if I had another C-section," she said. Clark spoke up when doctors demanded she have another C-section. "This mother had to say over and over again, ‘that's not what I want,’ to the point to where she was in tears crying," Jones said. Despite being told no numerous times, Clark persisted and had a natural, vaginal birth with baby Sahabiyat. 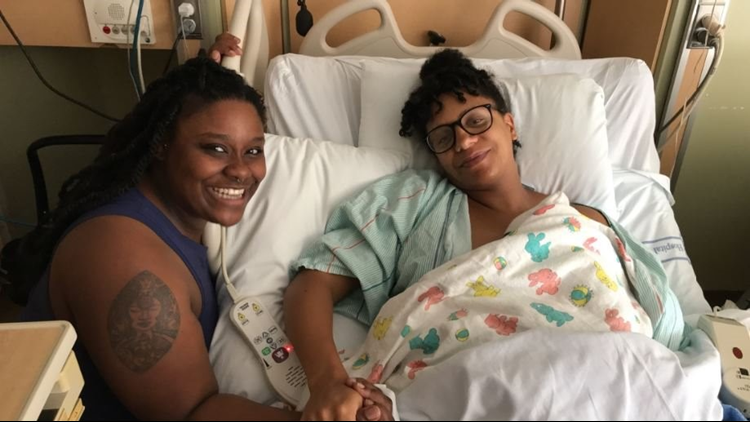 Kristina Clark and doula Rokea Jones. Clark says that wouldn’t have been possible without Jones’ support. "That was an effect of having an advocate with me, and that person was Rokea. There was just no way I could have done it alone." Jones says the work of a doula is to help advocate for families and empower them. “There is no more powerful place to advocate from then mom's own mouth," Jones said. Clark’s advice to other pregnant women: "Definitely trusting your own self and having folks close to you who can help you do that is really what it boils down to." In Washington state, the rate of pregnancy-related maternal deaths is 9 in 100,000 births, compared to 17 per 100,000 births in the rest of the country. In 2016, the Washington Maternal Mortality Review was established through Senate Bill 6534. It resulted in a report on maternal deaths from 2014-2015. The report found 69 maternal deaths. Of those 69, 16 were determined to be pregnancy related. That means the death was directly caused by pregnancy or a chain of events that started during pregnancy. "We found that hemorrhage, that's excessive blood loss during pregnancy, and hypertension, that is high blood pressure during pregnancy, childbirth or after pregnancy were our leading causes of death,” Lacy Fehrenbach, director of the Office of Family and Community Health Improvement at the Washington State Department of Health, explained. Of the pregnancy-related deaths, the state found that half were preventable. "There were missed opportunities in our state, and some of these women would still be alive with us today if they had received a phone call or perhaps a visit from a nurse in the days shortly after returning home from the hospital." She said, like the rest of the country, the state sees an increased rate of pregnancy-related deaths for women of color. "We also know that we all have biases, and when people of color interface with the healthcare system and the social service system, those biases impact how they receive care and how they receive services. So, we have to pay attention to that and start working to address disparities both inside clinics and outside of clinical walls,” she said. “If we really want to make a difference in the gap we see between health outcomes for -- in this case between white women and women of color." Fehrenbach says training is needed around disparities in the healthcare system. Senator Patty Murray calls the rate in Washington unacceptable. “I have heard anecdotally from African American women that often times when they tell a doctor a certain symptom they are dismissed and not listened to. If that's the case, we need better training,” said Murray. She wants all states to review maternal deaths to better understand why rates in the U.S. are so high. This year, the Senate passed a spending bill that Murray championed with a $50 million investment to address maternal mortality. The new funds will expand data collection efforts, support evidence-based programs to prevent maternal death, and improve care across clinical and public health systems. The investment includes $12 million to allow the CDC to support state efforts to establish and strengthen maternal mortality review committees that investigate deaths associated with pregnancy. "I don't want any other moms in our country, anyone, to die an unnecessary death having a baby. But the fact is we need to gather the data first, and we need to answer the questions of why this is occurring and then focus our resources and our education in the right place to change this. That is what I am doing,” Murray said. Each year, approximately 4,000 babies are born at Overlake Medical Center. For years, their teams have been running drills to reduce maternal complications and maternal mortality. The exercises for obstetric hemorrhage, hypertension, and other labor emergencies involve their entire care team. "If you have a reliable process, then you just know what to do, and you've practiced it. You are going to succeed," Margie Bridges, perinatal clinical nurse specialist, said. Overlake is part of a pilot program for monitoring blood loss during birth in a new way. They aren’t estimating blood loss like is typical in hospitals. Their teams are measuring the volume. There’s no guessing. Overlake also started incorporating a new tool called a Maternal Early Warning Trigger. It monitors patients’ vitals and activates a warning system if something seems off. For example, if a patient’s blood pressure is too high or too low, it sends out an alert to the care team. Overlake believes these kinds of tools will help them identify problems sooner, allowing care teams to intervene earlier. "We have a dedicated team of people that includes nurses, physicians, managers and administrators that support our efforts at reducing maternal mortality and keeping moms and babies safe in childbirth. If we didn't have that support at all levels we wouldn't be able to do this work,” Dr. Kristin Graham, medical director for Women and Infant Services at Overlake, said. KING digital journalist Kelsey Caulfield contributed to this report. 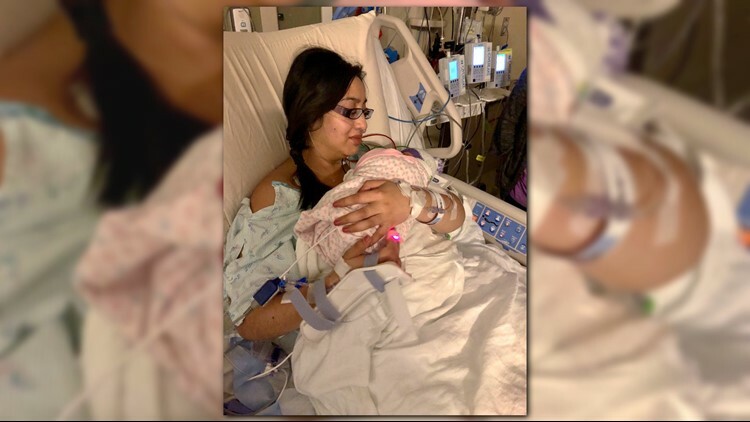 Editor's note: This report is part of a TEGNA series called "Mothers Matter" that looks at the disturbing trend of mothers dying during and after childbirth. Find out more here.